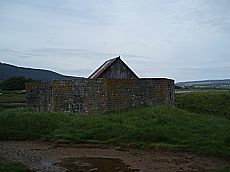 This World War II pillbox is on Evanton airfield near the runway. In this photograph taken a few years ago, it has a dummy roof, built in an attempt to disguise it from the air. However, last year the room blew off, and is now lying in the grass near the pillbox (see photo below). A variety of pillboxes, of different shapes, were built on the airfield, some still surviving. Pillboxes are found throughout the Highlands, protecting airfields, coasts, roadblocks and other military structures. Many are in a poor state and need to be recorded. Evanton airfield was built in the 1920s as a seasonal camp for the navy, known as Novar Airfield or Newton of Novar. In the late 1930s became RAF Evanton, and greatly expanded. The navy continued to use a small part, but the airfield was primarily used for practice bombing and air firing. Many of the hangars from this expansion still survive on site, as well as foundations for the accommodation camps. Then in 1943 and 1944 the airfield was again expanded, and became part of the navy again, known as HMS Fieldfare. Again, some hangars and huts survive from this period. The airfield is being investigated as part of an ARCH project in spring and summer 2013. A great deal of archive material survives, as well as some old photographs, and most importantly memories of people. Every Wednesday evening 7-9:30 there are sessions at Cornerstone Cafe in Evanton, as well as a number of walks in the next months. Click here for a programme, or get in touch with the ARCH office if you want to be kept informed of results.